Vice President Joe Biden (center), leads a roundtable discussion with top cancer experts as part of his National Cancer Moonshot initiative. From left to right: Mignon Loh, M.D. ; Alan Ashworth, Ph.D., FRS; Joe Biden; Jill Biden, Ph.D.; and UCSF Chancellor Sam Hawgood. 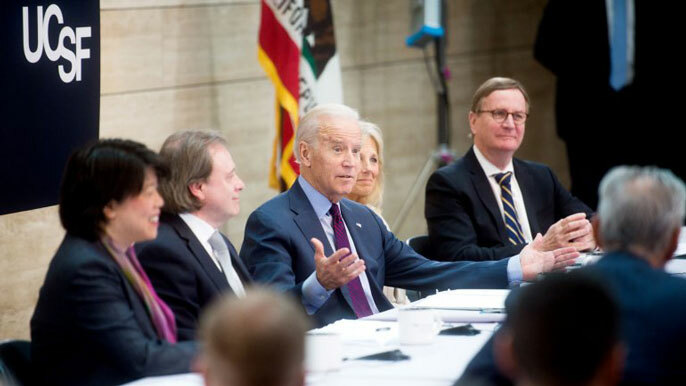 Vice President Joe Biden and his wife Jill Biden, Ph.D., visited UC San Francisco on Saturday to meet with top cancer experts as part of the National Cancer Moonshot initiative to develop new approaches that fast-forward the development of novel therapies. The Bidens visit a lab at UCSF Mission Bay to see the work of Zev Gartner (standing far left), Ph.D., who showed them a 3-D cell printer that creates tissue from an individual's own cells, to be used for both understanding cancer and for testing personalized therapies. The UCSF visit began with a tour of cancer research labs at the Mission Bay campus, followed by a spirited and at times emotional roundtable discussion. The panel – led by Alan Ashworth, Ph.D., FRS, who leads the UCSF Helen Diller Family Comprehensive Cancer Center – included Laura Holmes Haddad, a breast cancer survivor; Christine Miaskowski, R.N., Ph.D., professor of physiological nursing at UCSF; Mitchel Berger, M.D., chair of neurosurgery at UCSF; James Feusner, M.D., director of oncology at UCSF Benioff Children’s Hospital Oakland; Todd Park, a White House technology advisor; Jeff Huber, CEO of Grail Inc.; Mignon Loh, M.D., hematology-oncology division chief at UCSF Benioff Children’s Hospital San Francisco; and Jennifer Doudna, Ph.D., professor of chemistry, molecular and cell biology at UC Berkeley. The roundtable discussion at UCSF Mission Bay also included cancer experts from UC Berkeley, government and Silicon Valley. That risk paid off for Haddad, a BRCA2 gene mutation carrier who was diagnosed several years ago with stage IV breast cancer. Her doctor, UCSF’s Mark Moasser, M.D., fought hard to get her enrolled in a clinical trial for a drug combination based on an understanding of BRCA2 that has led to her remission. In an emotional moment during the roundtable, Joe Biden thanked UCSF neurosurgeon Mitchel Berger, M.D., for his help consulting on the case of Biden's son, Beau, who died last year from brain cancer. “I know it’s personal for you, but rest assured it’s personal for me too," Berger said. "I’m sick and tired of losing patients to this disease." Earlier in the day, the Bidens toured the UCSF Center for Advanced Technology, where they met with Zev Gartner, Ph.D., an associate professor in the Department of Pharmaceutical Chemistry in the UCSF School of Pharmacy, who showed them a 3-D cell printer that creates tissue from an individual's own cells, to be used for both understanding cancer and for testing personalized therapies. The couple also met with Wendell Lim, Ph.D., a professor of cellular and molecular pharmacology, to discuss immunotherapy by engineering immune cells that distinguish cancer cells from healthy ones. Vice President Biden and Dr. Biden Participate in a Roundtable on Cancer.